A motorcycle training class so unique that you can’t afford to miss it, your life may depend on it! ProRider courses are conducted by police motorcycle officers and civilians who have successfully completed the 80 hour challenging police motorcycle school. Chris has been throwing a motorbike around since he was 8 years old. He is a self-admitted Gear Head. According to him; it’s just something that gets into your soul. He has been attending Road Racing Track days annually since 99 as well as competitive Enduro and Hare Scrambles. Chris has been a Motor Officer since 2015. Not only can he be seen mastering a motorcycle, he is also an accomplished snowmobile enthusiast. Wyoming Mountain and Canada Deep Woods rides are some of his favorite locations to hit the snow trails. As Owner and Head Instructor for ProRider York, Chris is passionate about teaching others the skills he has honed. 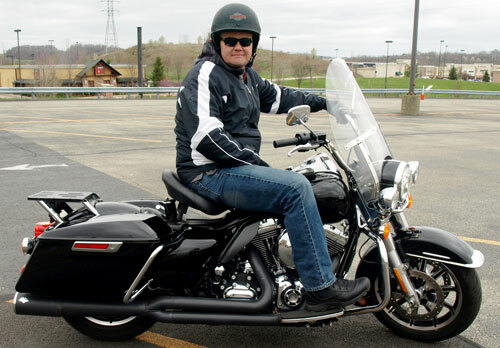 Mark currently owns and rides a 2001 FLHRCI Road King Classic and a 2004 FLHP Road King Police. He had been licensed to ride motorcycles since He was old enough in 1986 and he has continuously owned and ridden street motorcycles ever since. Mark works as a mechanic/ fabricator/ installer at a local independent motorcycle shop for the past 12 yrs, installing trike conversions and sidecars, as well as adaptive equipment for disabled riders. 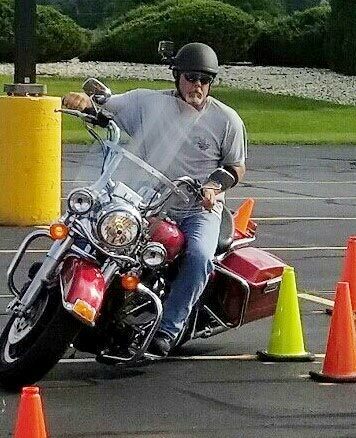 He became an MSF ridercoach with Pa Motorcycle Safety Program in 2010 and an instructor for Harley Davidson Riding Academy in 2015. Currently he is also employed as a coach/instructor in Pa and Md. Basic Rider Course 2 updated. Advanced Rider Course/Sportbike Techniques updated. Although he had never been involved with law enforcement, he began rodeo riding in competitions with his police friends two years ago.. Through this he had gained a much larger appreciation and respect for the skills and commitment level it takes to be a motor officer. He has successfully completed 56 hrs of police-style motor school for civilians at a top-level school run by active career Police Motor Officer trainers and competed in skills competitions in New Jersey and Michigan and plans to compete this year in Illinois and Pa. He is a lifelong motorcyclist and lifelong learner. Mark absolutely believes in the value of organized training and regular practice, and his steadily increasing skill level over the years is proof that they work. Mark looks forward to sharing his skills with all Prorider clients, to help them increase their personal skill levels and become more confident, safer riders. ProRider® motorcycle courses are conducted by expert police motorcycle officers who have successfully completed the 80 hour challenging police motorcycle school. The very best of the best. We will teach you proven techniques that are guaranteed to improve your riding ability and confidence. Classes cover slow speed maneuvers, confined space turns, crash avoidance, and braking challenges. ProRider® courses are conducted on your own bike, allowing you to truly learn it’s dynamics, handling, capabilities and limitations. Leave our course with the ultimate level of mastery over your vehicle. Questions? Interested in a Private or Custom Class? Contact us today!